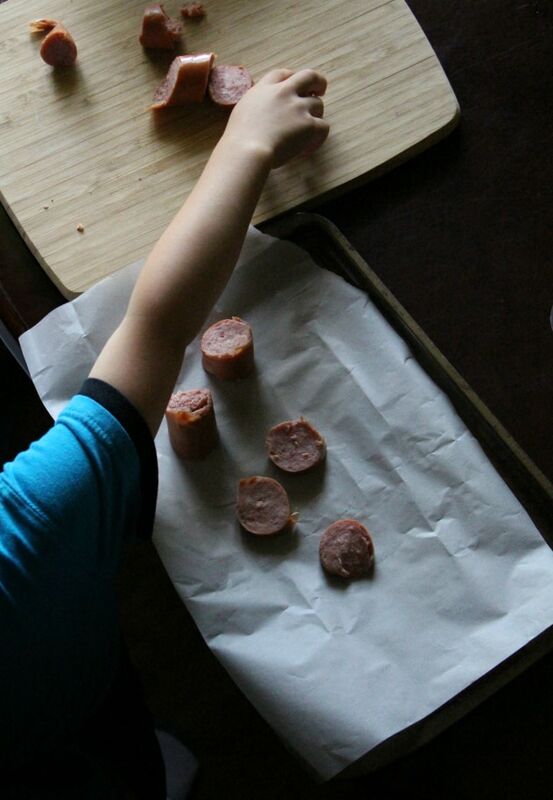 Get Kids Helping In The Kitchen With A Smoked Sausage Sheet Pan Meal! 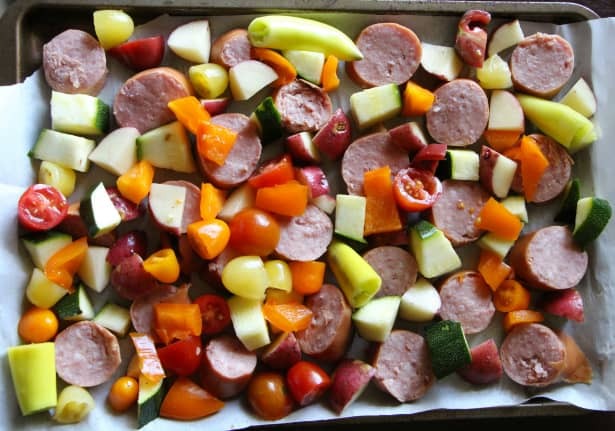 Smoked Sausage Sheet Pan Meal – Get The Kids Helping In The Kitchen! This sheet pan meal post has been compensated. All opinions are mine alone. Growing up, my mom would always make the best smoked sausage. Every one of us loved nights when it was on the menu. I remember her carefully turning each piece of cut smoked sausage in the pan and the delicious smell that filled the house. Funny how little things like that can make such great memories! My husband is a smoked sausage lover, so I always keep some in the fridge for nights when we want a delicious meal with minimum prep work. Then I discovered something. 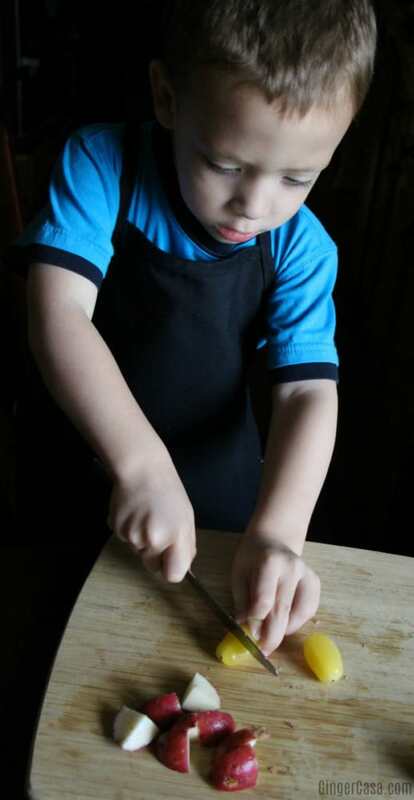 The boys LOVE helping me in the kitchen and cutting smoked sausage and veggies with a butter knife is pretty fun and easy for them. And so the Smoked Sausage Sheet Pan Meal began. 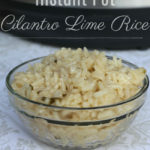 They help which makes it fun for all of us and the result is a delicious meal that we all love. 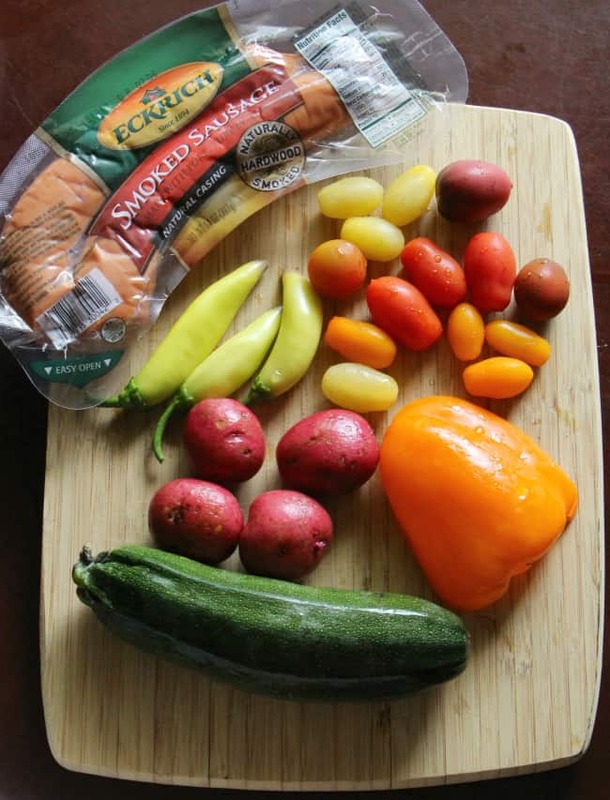 Fresh veggies are a must for the sheet pan meal as they complement Eckrich Smoked Sausage so well! Our favorites include cherry tomatoes, in many colors, red potatoes, bell peppers, zucchini, and fresh banana peppers that are from our garden. Eckrich smoked sausage is naturally hardwood smoked for the true smokehouse taste. The flavor is so good! Once I have all of the veggies washed, the boys can come in, grab a butter knife and a cutting board, and help me to prep everything. For some reason, cutting the smoked sausage is always a hit. The kids still need some monitoring and help, but once they get the hang of it, it goes pretty quickly. The three year old really loves cutting cherry tomatoes because they squish when you cut them! Once everything is cut, the kids can place it all on the sheet pan. 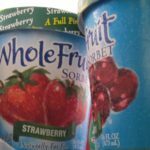 There’s no certain order or placement, which makes it great for kids. I try not to stack anything so it will all cook equally, but really that’s the only rule. If it all makes it to the sheet pan, I’m happy. Look at all of the beautiful colors on this pan! Pop it in the 350 degree oven (adults will need to do this, of course) for 25-30 minutes and it’s ready! It obviously depends on a child’s age, but only you know what your child is capable of, so have fun and let them do what’s safe! What other ways do your kids help in the kitchen? 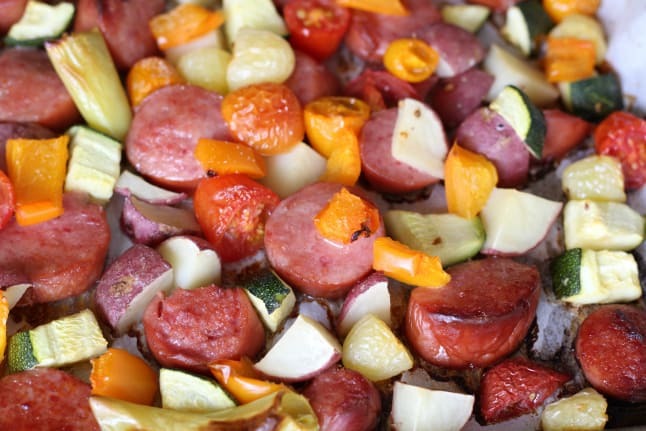 Smoked Sausage Sheet Pan Meal! 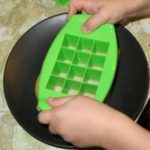 The kids can help you in the kitchen! 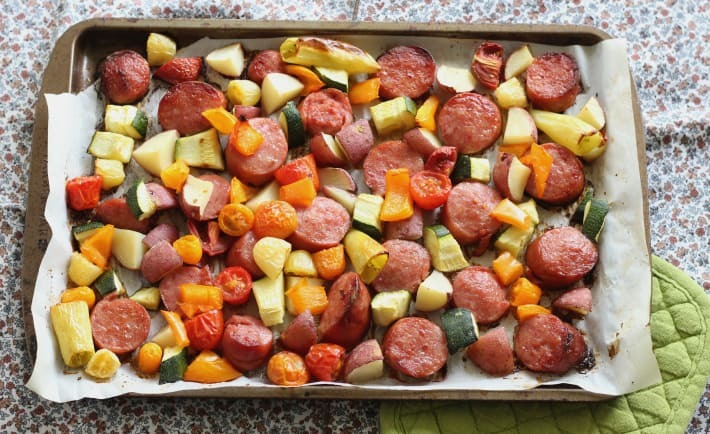 This easy, delicious Smoked Sausage Sheet Pan Meal is a hit! Wash all veggies and set them in a colander to dry. Open package of Smoked Sausage and place on a cutting board. Slice smoked sausage in 1/2″ pieces. Slice zucchini the same way, in 1/2″ pieces. Cut each red potato in about 6 pieces. Slice ends off of banana peppers. Cut bell pepper into smaller pieces, but not diced finely. Combine all veggies and drizzle with olive oil and salt, if desired. Place cut Smoked Sausage onto sheet pan lined with parchment paper. Place veggies on sheet pan, being careful not to stack them much. Cook in an oven preheated to 350 degrees for 25-30 minutes, until potatoes are tender. Let cool, serve, and enjoy! Simple meals like this lets us spend time together as a family, prepping, eating, cleaning up, and also doing fun things like going for bike rides and reading books as a family! See How We Make Food Fun and Exciting with FunBites!